This book contains recent photographs of Blackpool. 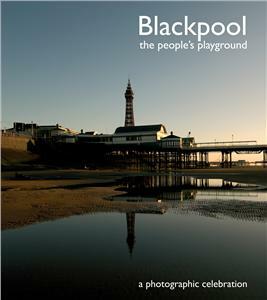 Blackpool has long been regarded as Britain’s undisputed capital of entertainment and a new book - Blackpool: The People’s Playground - is a panoramic tribute to this great seaside town, celebrating Blackpool’s glittering heritage whilst also putting a very emphatic focus on the future. Students at the Blackpool & the Fylde College’s School of Art & Design took many of the photographs and the book also features the winning shots from the nationwide ‘Blackpool - Take a Fresh Look’ photographic competition launched in the summer by visitBlackpool and the Lancashire and Blackpool Tourist Board, and supported by the NWDA. Incorporating a special foreword by Lord McNally of Blackpool, the coffee table-style book is published by Guy Woodland, who produced a similar publication for Liverpool when it was European Capital of Culture in 2008; as well as ‘Urban Reflections’, an EMA project in collaboration with HP, and a ‘Live 8’ book with Mike McCartney. Guy is a former student of Blackpool & The Fylde College. Cllr Tony Williams, Cabinet Member for Culture and Communities, said: “This book is the culmination of several years of work and is a true celebration of Blackpool - past and present. It is a wonderful coffee table book and showcases just how much there is to be proud of in our town. The book is available at all good book stores in the town and region, and tourist offices, priced at £15. It will also be available to borrow from all Blackpool libraries. Published by Woodland Publishing, the publication is a partnership with the Northwest Regional Development Agency (NWDA), Blackpool Council and ReBlackpool.